If you’ve been reading Houseologie for any amount of time, you already know I LOVE black paint. I have it in my dining room, my closet, and my Master bathroom. I also used bold black + white fabric in my 6 year old’s bedroom and will soon have some black paint in my master bedroom. Next to white, black paint is my absolute favorite paint to add amazing drama to a room. I have found unlimited inspiration on the internet for rooms with black walls. My Pinterest account is full of such rooms so I thought I’d gather several here to share with y’all. I hope you’re as inspired by these images as I have been. Kristen from Hunted Interior knows how to make a room and this one is no exception. I think the black paint really defines the whole space. Gorgeous and rich. My closet with its black walls makes the whole space feel more luxurious even though it’s a tiny closet inside of a master bathroom. This Teen Girl Bedroom Makeover from Jeanne Oliver just wouldn’t make nearly the same statement without the black paint. The touches of gold pair nicely with the black for a touch of glam! Wow! 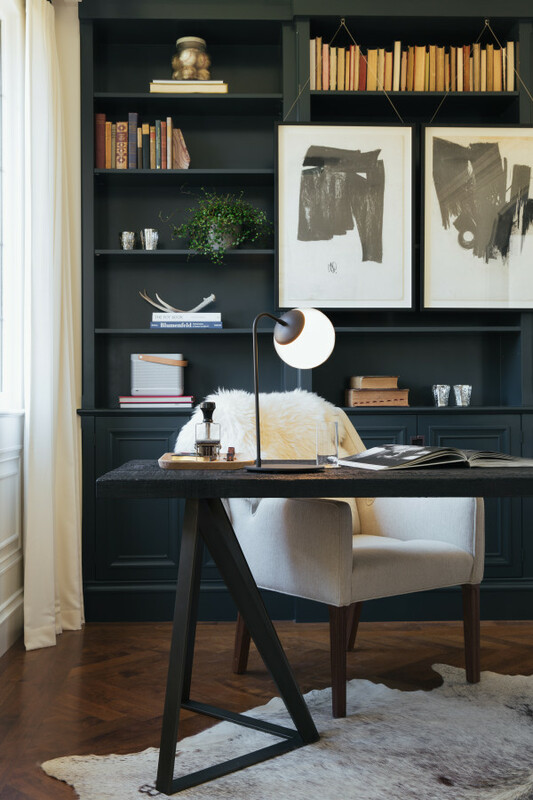 This black dining room from Apartment Therapy is stunning! I think every house needs at least one black room. This bold kitchen with its luxe black cabinets makes me all swooney. Love the black paint plus all the textures. My super fun black bathroom walls with quirky white flamingos. I just love this space so much! A gallery wall will always pop and look amazing on top of a black wall. Classic and wonderful design by Driven by Decor! This bathroom from Studio McGhee is seriously SPECTACULAR. Black planks, yes please! Black builtin bookcases will always, always win in my book – er, house. Black walls has never been something I would instinctively go for as I don’t like dark cave like rooms. However, there is no denying these rooms have a very classy look to them. And, black walls certainly make the other lighter objects in the room stand out. I need to have a rethink! I’m sure as with white there are many shades of black. What would you use in a 10×12 girls bedroom? Also what sheen?